I wish my teeth were whiter. This is one of the most common comments made by patients. Whiter teeth look healthier, younger, and more beautiful. It just so happens, this is one of the easiest and most affordable cosmetic procedures available. There are 3 common ways to whiten teeth. Many of my younger teenage patients have whitened their teeth with Crest Whitestrips. These are the over-the-counter whitening products. They do work well but take a long time because they are 1/3 the strength of dentist prescribed products. They also need to be adapted well to the teeth in intimate contact. If you have severely crowded teeth, this may be hard to do. Custom made whitening trays can be filled with dentist prescribed whitening gel and worn for an hour a day. Impressions are made of the teeth and then the trays are made onto the models. These custom trays allow intimate accurate fit of the gel to the teeth. Most people will treat their teeth once a day for 12-14 days. Results using this technique are dramatic. The fastest way to whiten teeth is done in the dental office. Most people have heard of Zoom! Teeth Whitening or another product called Boost. A protective barrier is placed over the lips and gums then the high strength whitening gel is placed on the teeth. 2 to 4 applications are done during this 1 hour procedure. Most patients will notice changes of 4-8 shades. 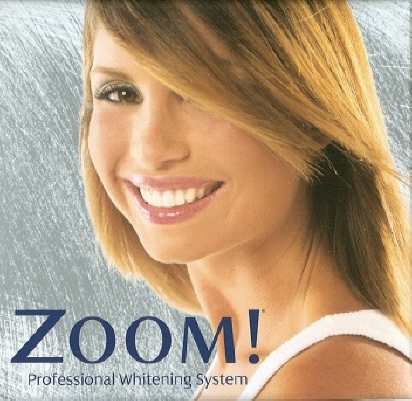 Some people may require additonal whitening to achieve their desired whiteness. If white teeth is something you have been wanting for some time, then contact your dental office to see if you are a good candidate.